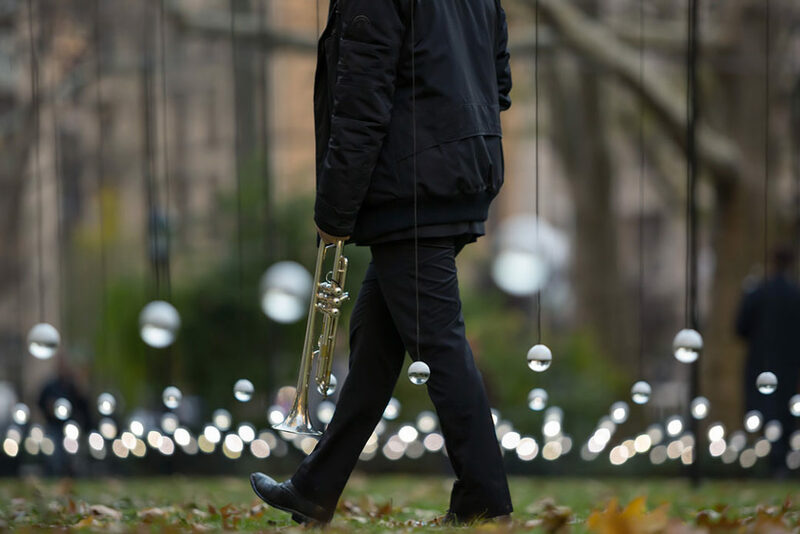 When Erwin Redl's Whiteout opened in New York City, Madison Square Park Conservancy commissioned Trumpet Clouds, a 60-minute mobile live-installation composed by Craig Shepard. The performance activated Whiteout and encouraged passersby to engage with the artwork. Oklahoma Contemporary continued this pairing. On March 23, Craig Shepard, Sandy Coffin, Ryan Gardner and trumpet players from the Oklahoma State University Trumpet Studio performed Trumpet Clouds at Campbell Art Park against the backdrop of the Oklahoma sunset. Visitors were invited to bid farewell to Whiteout, which closed on March 31. Trumpet Clouds was free and family-, kid- and pet-friendly. The performance moved throughout Whiteout and interacted with the sights and sounds of Broadway Avenue. Some audience members followed the musicians and walked along. Others brought folding chairs and blankets to enjoy this engaging performance for all ages. The film above, Two Days, Trumpets and Lights by Beth O'Brien, features music from Craig Shepard's Trumpet Clouds along with views of Whiteout during its installation at Madison Square Park. Craig Shepard studied trombone performance at Zurich University of the Arts before adopting the trumpet in 2005. He has performed at the New York Guggenheim Museum (NY) and the Whitney Museum of American Art. He has received commissions from the City of Zurich, Bozzini String Quartet, and Klangraum Duesseldorf. Shepard directs the Music for Contemplation series in Brooklyn, and co-organizes Creating Music Together workshops and retreats. Recent public installation projects include On Foot: Brooklyn and Trumpet City, which has been performed in Brooklyn, Seattle, Hanover, New Hampshire, Zurich and Bern. Sandy Coffin is a trumpeter and arranger based in New York City, founding member of Prometheus Brass, director of Brass Bands at St. Hilda’s & St. Hugh’s School in Manhattan and a tutor with the National Youth Brass Bands of Scotland. She has performed with the Chamber 16 New Music Ensemble, Finnish National Opera and The Wallace Collection Ensemble. Coffin earned a Bachelor of Music in Trumpet Performance and a Bachelor of Arts in Latin from Oberlin College and Conservatory of Music, followed by a Master of Music from the Manhattan School of Music. Dr. Ryan Gardner is the Associate Professor of Trumpet at Oklahoma State University in Stillwater, Okla. and directs the university's trumpet studio. Gardner received a Bachelor of Music from the Eastman School of Music in Rochester, NY, a Master of Music from Rice University - Shepherd School of Music and a Doctor of Musical Arts from the Manhattan School of Music. He has worked with principal trumpeter Mark Gould and Vincent Penzarella of the New York Philharmonic. Gardner also maintains a private studio and teaches master classes locally and internationally. Members of the Oklahoma State University Trumpet Studio that performed include Ben Chapman, Matt Daigle, Matt Herron, Caden Holmes, Will Landon, Noah Mennenga, Ian Mertes, Daniel Montalvo, Nick Nusser and Jacob Rylko. Open Now until 10 p.m. • April 20, 2019 @ 8:02 p.m.